It’s the most wonderful time of the year! The Christmas season brings many reasons to celebrate and gather. Share your love and joy with friends and family this year by hosting an unforgettable Christmas party. 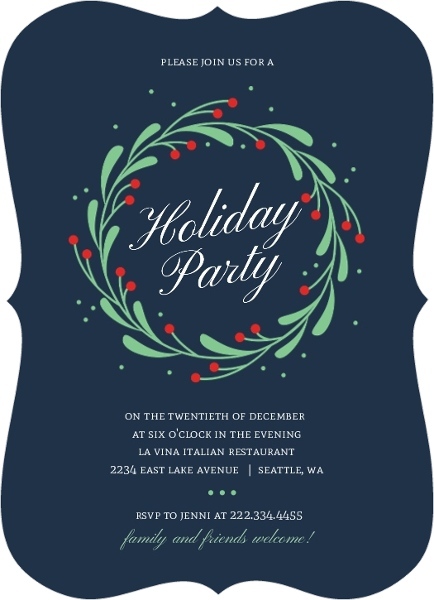 Notify your loved ones with beautiful holiday party invitations. Include inspirational wording in your invites to get your guests into the holiday spirit. 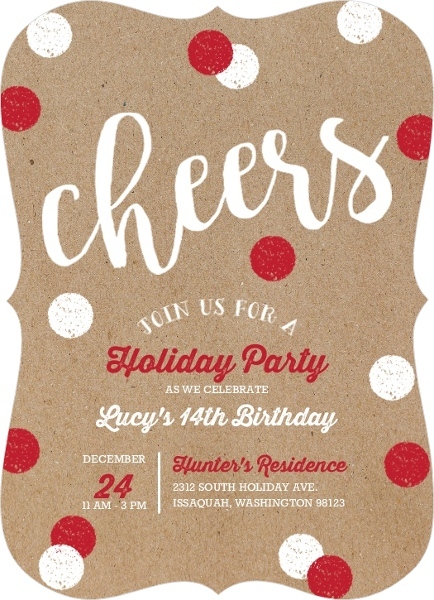 Use these cheerful Christmas party invitation wording ideas to get started! Before you start thinking about your Christmas invite wording, you should already have picked out your invitation. Still haven’t found the right invites? No worries! 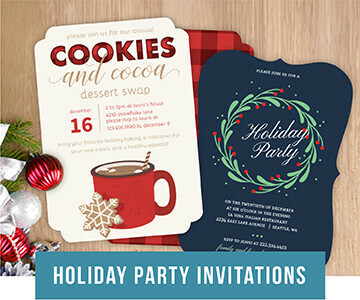 Check out PurpleTrail’s nice selection of Holiday Party invitations. 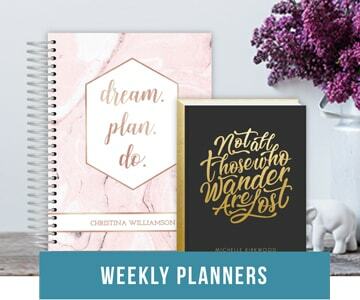 Choose to create a custom invite from scratch, or add custom wording and personal photos to one of our beautiful design templates. Your guests will love receiving an invitation you added personal photos and wording to! Sometimes, finding the right Christmas party invitation wording can be challenging. 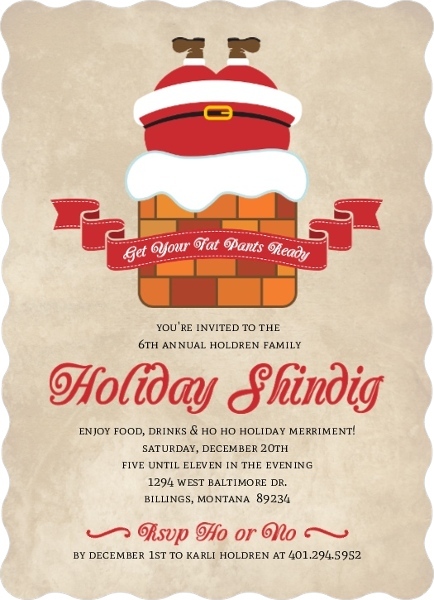 That’s why we’ve come up with this great list of Christmas party invitation wording ideas. 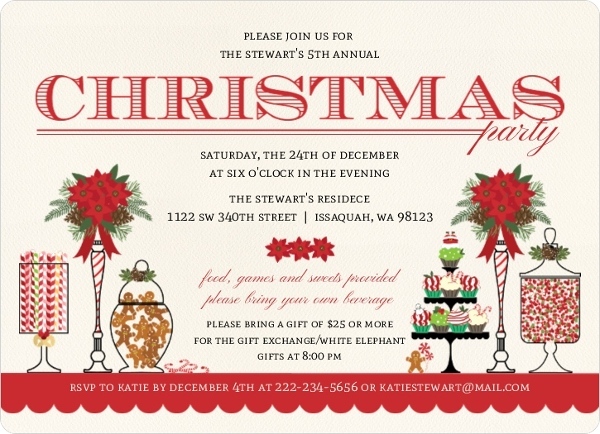 Fill up your invites with these fun and festive Christmas party invitation wording suggestions. In addition to including a warm and friendly message, also make sure to include the time, place, and details of your party. Choose your wording wisely! Your guests will need to be well informed so they can properly prepare for your celebration. Good luck! It’s a Christmas caroling party! Please drink and be merry with us! Christmas Party at our house! It’s time again for Christmas Cheer! Let us gather again and celebrate with loved ones so dear! Christmas is here! Come one come all from far and near! Share in our merriment and cheer! Please join us for a sumptuous festive feast. If there’s a feast, Santa’s there. He might need some help though. Merry Christmas to all! Wishing you joy and good tidings! Please join, as we rejoice in our Lord and Savior. Please join us for a Christmas dinner filled with thanks and celebration. Hark the Herald Angles Sing. Let us rejoice in His abundant blessings. Please join us for a Christmas celebration. Celebrate the joy of the season. Join us for a Christmas party! Join us for a celebration of Christmas goodwill and cheer! Join us for a Holiday celebration! We’re throwing a Christmas party to celebrate the beauty of the season! And we’re celebrating the the season! Join us for merriment, joy, laughter and cheer! Let’s raise a glass and toast to the spirit of Christmas! Join us for a festive celebration. We hope these wording suggestions gave you the ideas and inspiration you were looking for! Your friends and family members will love receiving a party invitation with these cheerful wording ideas. 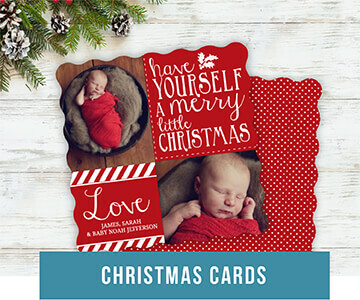 If you still feel like you need more Christmas card inspiration, take a look at our Holiday Invitation article!